Join us for a live listening room with the five finalists of SOHP’s 2019 Sonic South short doc audio competition In Sickness and In Health on Thursday, May 9 at 7PM at the Chapel Hill Public Library. Featuring short audio works from local producers using SOHP archives to explore healthcare, medicine, and illness in the South. For more information visit our Sonic South page. Celebrate Women’s History Month and learn about pioneering Carolina women. This is the Time walking tour highlights the history and experiences of women connected to Carolina, as captured in Southern Oral History Program collections. The tour is available on Friday, March 29 at 3PM through the UNC Visitors Center. Go here to make a reservation or call 919-962-1630. Join us for programming commemorating the 50th anniversary of the 1969 UNC Foodworkers Strike at the Wilson Library on Tuesday, March 20, 2019 from 4:30-6:30pm. On February 23, 1969, after repeated attempts to bring their grievances to the attention of the University administration, food service workers at UNC-Chapel Hill walked out at the beginning of the dinner shift. With the support of the Black Student Movement and other allies, the striking workers highlighted labor and racial inequities on campus. After a month of direct action and negotiation—during which Governor Robert Scott sent the state patrol to campus and mobilized the National Guard in nearby Durham—the strike ended with a wage increase and improved conditions for the food workers. It was one step in the ongoing fight for workers’ rights at UNC. To commemorate the anniversary of the strike, the North Carolina Collection and University Archives at Wilson Library have commissioned a performance directed by Kathy Williams, a faculty member in the department of dramatic art at Carolina and a member of PlayMakers Repertory Company. Actors from PlayMakers Repertory Company will tell the story of this key moment in the history of labor and activism at the University. The program draws from the SOHP’s oral history project on the strike, along with contemporary news accounts and archival documents at the Wilson Special Collections Library. It focuses especially on the perspectives of the workers and student activists who led and participated in the strike. The evening begins at 4:30pm with a reception and viewing of the exhibit, “Service Not Servitude” in Wilson Library’s North Carolina Collection Gallery. The performance begins at 5:30pm at the Pleasants Family Room at Wilson Library. For more information about the program email libraryevents@unc.edu, or call (919) 962-4207. Explore the SOHP’s digital exhibit on the Foodworkers’ Strike, and listen to The Ladies in the Pine Room, an audio documentary produced by former SOHP interns. Upload a copy of your current resume in a Word document or PDF. I have had the pleasure of working with Orange County’s Department on Aging to help bring filmed oral histories about the history of Orange County to its citizens. The idea was first suggested by members of the Project EngAGE Intergenerational Senior Resource Team (SRT). Project EngAGE is a 13-week senior leadership program aimed at training local older adults to become community leaders who help their communities become ideal places to age. After course completion, Project EngAGE graduates join a variety of different SRTs which all focus on community engagement around aging topics. The goal of the Intergenerational SRT’s Speak Out! project is to get high schoolers in conversation with lifelong members of their communities. With the help of community partners, the SRT has recruited four older adults from different areas of the county to tell their stories and share the history of Orange. With ages ranging from 80 to 106, these narrators can give us profound insight into all of the failures, tribulations, triumphs, and joys of our past. 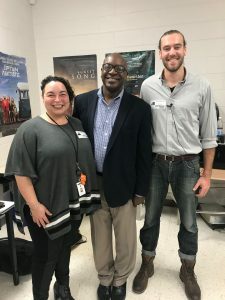 To engage the next generation in learning about the past, Orange County has partnered with Andrea DeGette’s videography students at Cedar Ridge High School. Using the skills they’re currently developing as documentarians, DeGette’s students will work as interviewers, videographers, editors, and directors to create a documentary of these life history interviews to share at two screening events in Orange County’s senior centers in May. On Friday, February 8th, I had the honor of giving an introductory training on oral history’s methods and best practices, as well as practical interview tips, to these future historians. As we discussed the ins and outs of the interview process, I was ecstatic to witness the curiosity and engagement of the students. To practice the methods we discussed, the students paired up and took on the role of either narrator or interviewer. Their challenge as interviewers was to use one of three provided prompts and to go deep with their narrator on one line of questioning for six full minutes. 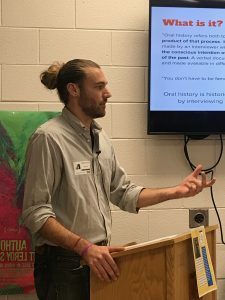 Using their burgeoning chops of engaged listening and strategic open-ended questions, students got a taste of an afternoon in front of an oral historian’s microphone. Stay tuned for updates about the Speak Out! Documentary. Special thanks to Bobby Cobb, Betty Myers, Shenae McPherson, Officer Andre Richmond, Andrea DeGette, Cedar Ridge High School Videography Club, and the Orange County Department on Aging for their enthusiasm and dedication to this project and documenting the voices of Orange County. Anne Bennett, Michael Leydendecker, and Elly Thompson (not pictured: Jona Bocari). The spring semester is underway and flying by, and we’re thrilled to introduce our 2019 spring SOHP interns. They’ll be focusing their research and fieldwork on interviews with North Carolina members of the 2020 Vote Centennial Initiative, leading up to the centennial of the passage of the 19th amendment. Anne Bennett is a junior majoring in Southern studies and Jazz studies. She plays jazz saxophone professionally, and does comedy both on and off-campus. This past summer, she worked as a production intern at The Late Show with Stephen Colbert. She plans on pursuing a career in comedy production once she graduates and looks forward to finding ways to present archival research and tell women’s stories in new and creative ways. Jona Bocari is an international Morehead-Cain scholar at the University of North Carolina at Chapel Hill, majoring in economics and history. Born and raised in Albania, she studied at the United World College of the Adriatic, an international high school in Italy before joining Carolina. A native speaker of Albanian and fluent in English, Italian, Spanish and French, she is deeply passionate about global perspectives concerning issues of justice and the power of stories to drive change. Michael Leydendecker is a senior majoring in history and political science. A native of Winston-Salem, North Carolina, Michael enjoys running and volunteers teaching civics in Durham at a local elementary school. He is looking forward to learning more about oral history, the American South, and giving a voice to a part of its rich history. Elly Thompson is a junior from Charlotte, North Carolina who is majoring in public policy and minoring in history. She is interested in studying the intersection between historical representation and memory in American policy making. Outside of academics, Elly is a member of the Alpha Chi Omega Fraternity whose main service focus is Domestic Violence Awareness. Through this organization, Elly has helped execute events to support local women’s shelters, including the Chapel Hill Compass Center. Since May of 2018, I’ve been interviewing a variety of narrators—from nurses and doctors to clergy and academics—about their experiences with medicine. With my own research centering around aging and end of life, death and dying is a natural point of discussion between myself and the narrators I’m interviewing. Through this process and these conversations, I have come to hold a strong conviction that the connotations evoked by using words like “death” and “dying” in our culture are sorely in need of a semantic overhaul. As a result, I set out to further understand how people who have brushed against death (in any sense) talk about it, and I’d like to share a few of those stories with you through a series of blog posts. What is the state of death in our culture? What effect is created when we experience death in oral history? How does experiencing death in narrative translate to our own understanding of mortality? How do moral judgments of good and bad play into these stories? As with any kind of story, it is important to consider how we exchange stories of death. We walk a thin line between experiencing a narrative and creating a spectacle of it. An important piece of maintaining respect for the story is holding reverence for the narrator and their narrative. After all, the stories of death that I have helped archive touch on some of the most vulnerable and momentous episodes of each narrator’s life. [i] Sharing in those moments is a privilege and I hope you will join me maintaining an air of respect as you listen to these stories—something like whispering while in an old cathedral. It’s difficult to explain why so many deaths aren’t satisfactory, but Ivan Illich put it this way: “The ritual nature of modern health procedures hides from doctors and patients the contradiction between the ideal of a natural death of which they want to die and the reality of a clinical death in which most contemporary [people] actually end.” [iii] The rise of hospice and palliative care has advanced the experience of dying with bounding strides in recent decades, but there’s still a great deal of work to do in order to rectify our wish to die at home with the reality of that experience. The Conversation Project posits that increasing our conversations about end of life is a good place to start. [iv] With the rise of projects centered around the medical humanities, such as the Stories to Save Lives Project from SOHP, we can work within a new framework to consider death and dying differently. In like fashion, I hope that through these blogs posts, you will gain a little more familiarity (and perhaps even comfort) with not just the topics of death and dying, but discussing them—an essential first step towards creating a satisfactory end of life story for yourself and your loved ones. I’ll leave you with one last thought to ruminate on. In this clip, Brenda McCall, a retired nurse, considers the hard work of sitting with one’s own mortality. She attributes the continuum of declining independence we experience as we age to a fundamental fear of death. Perhaps accepting our own fragility is the first step towards accepting our own mortality. At almost any age we can observe the body’s failures and begin to do the difficult work of accepting our mortality and preparing for our (eventual) deaths. i See Christine Valentine, Bereavement Narratives: Continuing Bonds in the Twentieth Century (London and New York, 2008). Each year the Southern Oral History Program offers grants and fellowships as a means for undergraduate and graduate students to have the opportunity to expand their skillset and conduct research using oral history. Currently applications are open for both our Summer Undergraduate Research Assistantship Awards and the Jacquelyn Dowd Hall Research Fellowship for graduate students. Applications for both are due March 1, 2019 for consideration. We are also sharing a link to the Summer Visiting Research Fellowship through the Wilson Library. Learn more about each award and how to apply below. The Special Collections Library Audiovisual Research Fellowship promotes the scholarly use of Wilson Library’s rich audiovisual collections (including the SOHP’s archive), thanks to The Andrew W. Mellon Foundation, offering $2,500 to support the intensive, innovative, and impactful research use of its collections. Deadline for submissions is February 15, 2019. For more information and links to apply, visit UNC Libraries’ Summer Visiting Research Fellowship page. Submit a research proposal and research plan that draws deeply and substantively on the collections of the Wilson Special Collections Library to support your research. Commit to a full-time research residency of at least ten days at the Wilson Library that will occur between May 1 and September 1. Agree to participate in the intellectual life of the Library and the fellowship program, which will include a public presentation of research findings and experiences and the submission of a brief research report. Fellows may be invited to submit papers to a capstone symposium in Southern Studies that will take place in 2022. Have or be actively pursuing the terminal degree in their discipline. 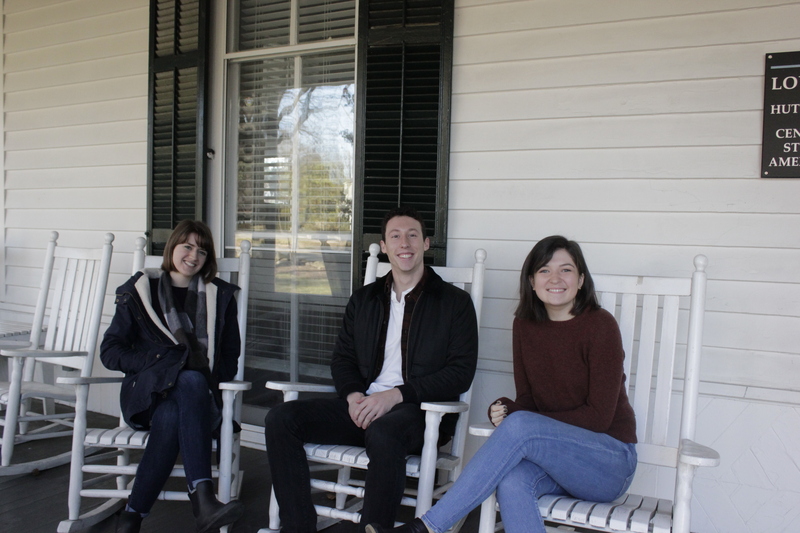 The Southern Oral History Program is offering three competitive summer 2019 undergraduate field research awards for students at UNC Chapel Hill. Summer field researchers will receive a $2500 stipend for 10 weeks of summer oral history fieldwork that includes researching and collecting oral histories for one of SOHP’s research projects, Stories to Save Lives: Health, Illness and Medical Care in the South, or Southern Mix: Voices of Asians and Asian Americans in the American South. The SOHP will offer two field research awards for Stories to Save Lives, and one field researcher award (thanks to the Carolina Asia Center) for work on Southern Mix. Deadline for submissions is Friday, March 1, 2019 at 5PM EST. Field researchers must commit to one week of intensive oral history training in late May 2019 at the SOHP, followed by nine weeks of field research, for an expected total of 200 hours inclusive of the bootcamp. See below for more detailed information on the research topics. Learn more about each project and how to apply here. The Jacquelyn Dowd Hall Research Fellowship is made possible by its namesake fund, in honor of the founding director of the SOHP. The award provides one graduate student with support to pursue research pertaining to oral history during the summer of 2019. One $4,000 summer fellowship will be awarded to a graduate student attending the University of North Carolina Chapel Hill who has taken Introduction to Oral History (History 670), or who can demonstrate competency and experience with oral history methods. To apply, please visit this link to submit a CV and two-page project proposal that details your research plans, timeline, and connection to oral history. Questions may be addressed to Sara Wood at swood@unc.edu.